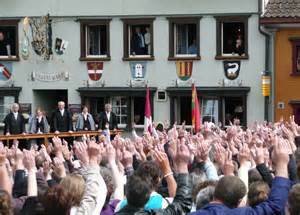 This is a picture of the Direct Democracy of Switzerland where the people get to vote on all issues that effect their country and community. Yes even the budget. The Swiss System of Democracy is the most advanced Democracy on the planet. In Switzerland the People are sovereign, meaning that it is the people that hold the supreme power, not their governing bodies. Here in Canada, we come from a tradition of Parliament supposedly being the supreme governing body, which is a propagated fallacy because the majority of power is held in the hands of one man, the Prime Minister, who delegates, or withholds power at his/her pleasure. This is a very important consideration, whereas the Swiss have every mechanism possible to keep power held away from their political figures so that the power remains, and always will remain in the peoples’ ability to choose the course of action in their country. Case in point, in the Swiss System of Democracy there are 5 leaders of the country, who are merely administrators of the government, more clearly these 5 are Bureaucrats that do not have any power of decision like Canadian, American, or most other Western Nation Leaders. The decisions of policy, direction of the Nation, and even Budget Bills and spending are made by the People in their 3 to 4 Referendums a years. After the Referendums are held the Administrators go about accomplishing what the People decided. The leaders rotate whom will be the head administrator, so that power never stays in the hand of one person long enough for them to try to make changes that will bring power to themselves. The Swiss truely understand the principle that Lord Acton is famous for, “power corrupts and absolute power corrupts absolutely”. 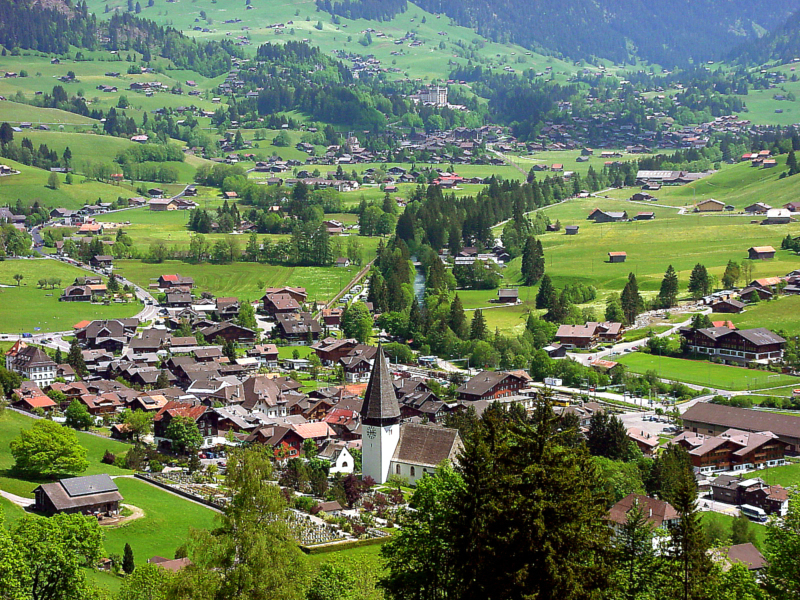 The Swiss were wise enough to want checks in place so no one could even think of amassing power to themselves. It seems to be in harmony with wanting True Democracy, to protect it. As a comparative study, in Canada, we come from a British Parliamentary Model of Government, where the power had been ripped from the King and then the power was held by the top leaders, and to this day the model has remained the same. Why would leaders then turn around and give power down to the people if you can keep it to themselves? Well, unless the people are on the verge of revolt, in which case you would give the power to those who are rightful heirs of the power. If you were going to lose your head because you were a leader and refused to hand over you might have a change of heart. So how did the Swiss get in this sweet spot of wonderful Democracy? In the Swiss’ past there had been a dispute over some public policy, and a civil war almost began over it. A civil dispute began by the smaller groups of the Swiss, the French and the Italians, got angry at a decision made by the larger group, the German speaking Swiss. You can visualize it, the more passionate French and Italians were angry and they got their pitch forks and went to the place of government wanting change. It got hot to the point where it seemed that blood was going to flow, and in the end the Swiss decided that they were all countrymen, and they did not want to spill each others blood over some small decision. So someone in the crowd was familiar with the American State policy of holding Referendums. They held a Referendum on the issue that diverted anger and a civil war, and they must have decided that the whole experience was so effective and satisfying that they would continue to let the People make all the decisions. I must also point out that they must have had leaders that lead the process, and that they must have been humble sort of folks that loved their country above their own love of holding the power. Are you listening Harper and Obama? Because this change was benevolent and brought about by the leaders of the time there was no need for a Recall Mechanism; they simply set up a system where the leaders did not, nor could not hold power, so there was no need for Recall. (You will note in my writings that I state that we will at some point need Recall because our leaders will not give power over to the People unless it is ripped from them). The Swiss maintain control over power their leaders by not giving the leaders any real power and the people having the mechanisms of Initiative and Referendum. If a leader did make a decision which the People disagreed with the People can collect a perscribed number of names on a petition to force a Referendum by which the People would decide the issue. Referendums are a very useful democratic mechanism. Everyone is familiar with the idea of people getting a say when the people are given a referendum, but there are other features that the people get with Referendums. In Canada, the Harper Gov’t love their Omnibus bills in which they can include many pieces of legislation from many topics. There last Omnibus bill raised the age for seniors to get old age pension and the same bill changed environmental legislation and also had legislation that would allow large corporations to infringe on the rights of the Aboriginal people and their land. Harper’s legislation could not simply be snuck through in Switzerland because each item would have to be ratified individually by the people via a referendum. In Canada, during an election the parties lay out their platforms for the people to decide on whom they will vote for. You like this from the Conservatives, but not that idea, you like this from the Liberals, but you don’t like that, and so on with all parties. Choosing a Government is a very important choice in Canada, or the US, because making a big mistake in whom you elect may relegate you to 4 to 5 years with the wrong people (so we find our every time the party in power becomes corrupt and we can’t rid ourselves of them until the next election). We have a Senate Scandal in Canada, and the Prime Minister may be embroiled in it, but we may be stuck with him for 2 more years (if Harper has a Rob Ford Moment and decides that he is staying no matter what). With Referendums each piece of legislation is looked on its own, which eliminates the problem of a party with bad policies or an secret agenda. A feature of the Swiss System that Canadians are not familiar with is Initiative. Briefly, Initiative is a Mechanism whereby if the politicians did put in legislation that the people disagreed with, voters would start a petition and get the required number of names on the petition that would force a referendum on the bill. This mechanism keeps politicians honest and knowing that they have to do only what the people want, or the People will correct them very quickly. The other wonderful thing about Initiative is that it gives the People the right to promote ideas that would be good for the Nation. Again, a petition has to be started and enough citizens must also sign to get the idea presented as a referendum and by law a referendum must be given. Initiative give the ordinary citizen the opportunity to contribute to the betterment of their society. If we think of Canada’s Legislature there are only 308 members, mostly yes men to the Prime Minister, and they are the ones that are supposed to come up with all the good ideas. Not likely. Are there no other smart people, or business people, or Academics with good ideas to make Canada a better society? Then there is definitely a place for Initiative in Canada. Only Canadians have to learn to believe in themselves. For your consideration I add a You Tube clip of the Swiss System of Democracy. If there is a flaw to the Swiss System is that the People are so well served by the system they can afford to be complacent. I would love a system that worked so well people could afford to become a bit complacent. If you were informed by this post, maybe others will be as well, please share it on Facebook and other avenues of sharing. A big part of Democracy is the people becoming informed. While watching this You Tube clip, can you imagine Canadians having this open form of Democracy? I hope you can because before we can achieve a better Democracy we must first know about one and then believe we can achieve it. This entry was posted in Democracy, Direct Democracy, Esencial Information for Democracy, Swiss System of Gov't and tagged Canada, Canadian, direct democracy, Swiss, Swiss people, Swiss System of Democracy, Switzerland, United States. Bookmark the permalink.